One of the many joys of the holiday season is the opportunity to say ‘Thank You’ to all my readers. Your likes and comments are wonderful to see and read! Here’s wishing you all a very happy and peaceful holiday season and all the very best for the New Year!! I look forward to catching up with you again in the New Year! 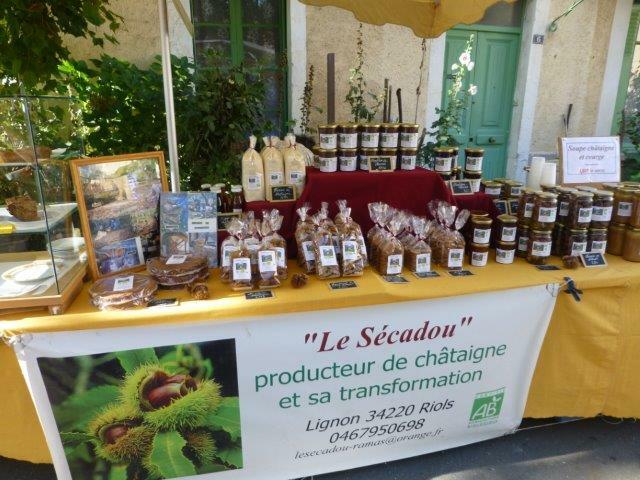 The title refers to the Fete de la Chataigne, the chestnut festival, in St Pons which has been taking place every October for many, many years. 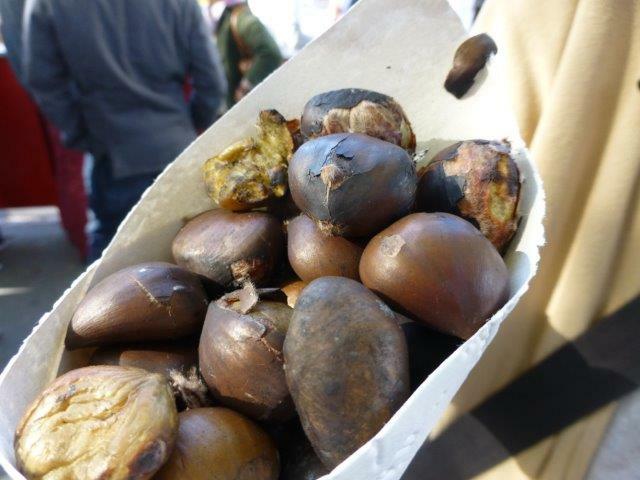 A few months ago, when I enquired for the exact date with the tourist office, I was told that there would be no chestnut festival this year, that it had been cancelled. I was completely speechless – those of you who know me can attest that that’s not something which happens often! 😀 How could one of the biggest autumn festivals in the area be cancelled? A little digging on the grapevine revealed some possible reasons. During the municipal elections earlier in the year, the voters of St Pons had elected a new mayor. It appears that some of the organisers of the festival had been on the losing ticket, and felt personally slighted during the electoral campaign. They decided not to continue with the organising of the festival, and hence the information was put out that there was to be no Fete de la Chataigne this year. Back in August I spoke with one of the traders who is a regular at the fete, and he was devastated at the prospect, as the fete is an important fixture in his sales calendar. I imagine that for many of the clubs and associations in St Pons, such as the parent-teacher association and the rugby club, the fete is their main fundraiser of the year, and a cancellation would leave a fairly noticeable hole in their budgets. As the time of the fete drew nearer, I checked again with the tourist office, and this time the answer was different – the fete would be taking place after all, on the last weekend of October, as before. Yippee!!! 😀 Apparently the new mayor and his council had mobilised as many of the local associations and clubs as they could, to help make sure that this year’s fete would be as good as ever. I visited the fete on the Saturday, as it’s usually the less frequented day of the weekend. The weather was glorious, sunny and warm, in total contrast to the previous year – see the article here – when the weather was grey and drizzly. I was joined by a few friends, and we got there early AND bagged a parking space not too far away 🙂 !! 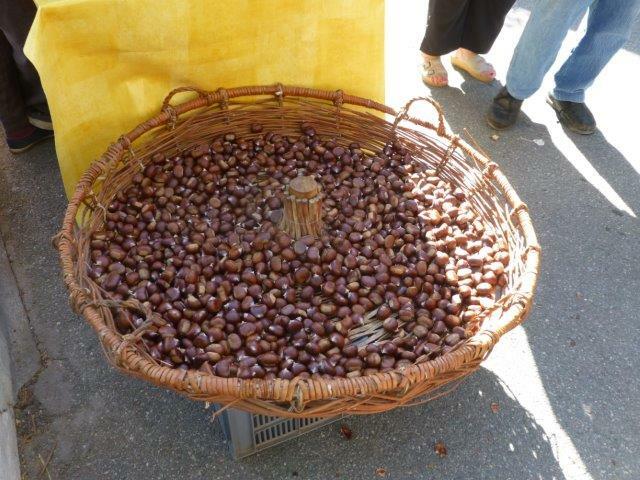 The very first stall we came to looked interesting: a food truck, offering a variety of chestnut themed food. We decided to earmark that for our lunch, on our way back from exploring the fete! The selection of stalls at the fete was eclectic and wonderful, as always! No changes there!! From cheese to vanilla, via saffron, garlic, and sausages, from balloons to baby boots, and everything beyond – it was all there, and wonderful to see, smell, taste and buy! In the big square the chestnuts were being roasted in enormous steel drums as always, with the wood for the fire piled up high. Here, would you like to try one? Careful, don’t burn yourself, they are quite hot!! There was so much tasty looking food, tempting us to stop for lunch, such as the aligot below (potato puree with fresh cow’s cheese), but we held onto our resolution to try the food truck. 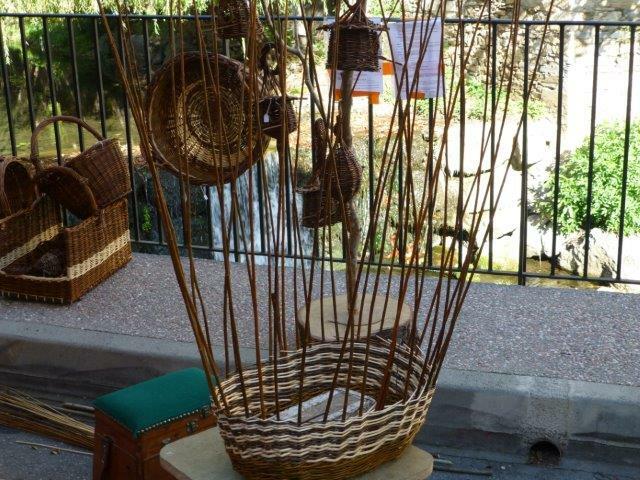 The basket-weaver from last year was there too, with more beautiful offerings! We did eventually head back towards the car, and “our” food truck for lunch. 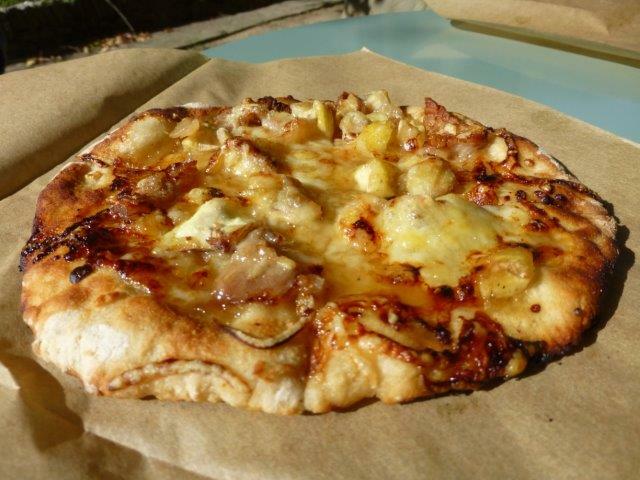 The sign said Chez Tina, and the menu had been specially planned for the chestnut festival: small pizzas with bacon, caramelised onions, chestnut pieces, cheese, and chestnut honey; chestnut soup; chestnut gnocchi. There was also pannacotta with chestnut honey caramel, and a chestnut cake, to follow our main course. As we stood admiring the inside of the van, and deciding what to order, we noticed a sticker saying “Taos” on the counter. So we asked Tina whether she’d visited there, and it turned out that she’s actually a native of Taos, New Mexico, who has lived in France for some time. Her French was very good. I would have never imagined her to be from the other side of the Atlantic ocean! We had a good chat and a few laughs. 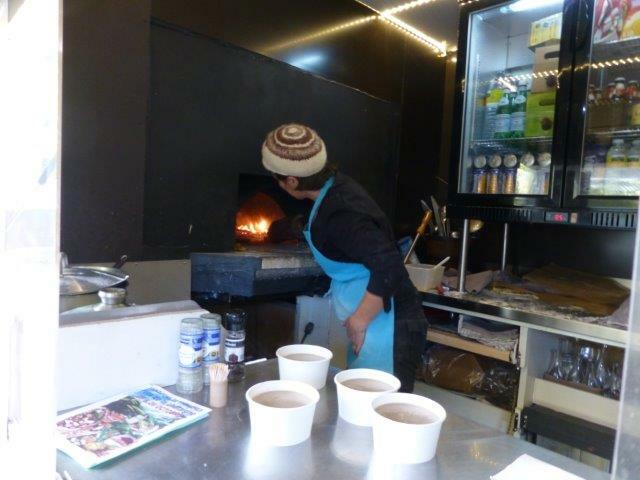 Here’s Tina preparing our pizzas in her wood-fired oven. 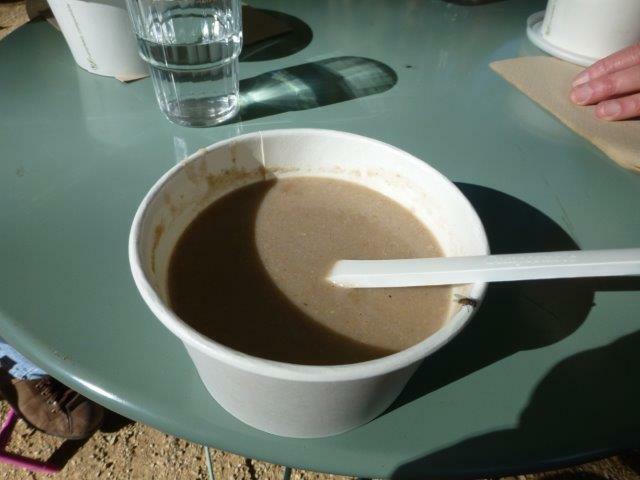 We decided to have some chestnut soup followed by pizza – since chestnut soup can be a little rich we shared two portions between the four of us. But we each had our own pizza!! Of course we couldn’t resist dessert – and somehow I managed to miss taking pictures of the pannacotta, and the chestnut cake, with the chestnut honey caramel. How greedy of me! All the food was totally delicious, and we were all so glad we had waited with our lunch!! 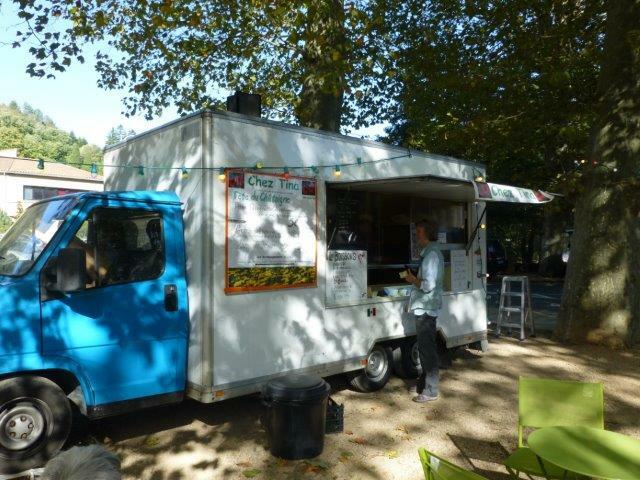 Tina is a regular in St Pons with her food truck, and you can find out more via her website. I can tell you she was planning to take some time off during the winter, but I am looking forward to seeing her again before too long! 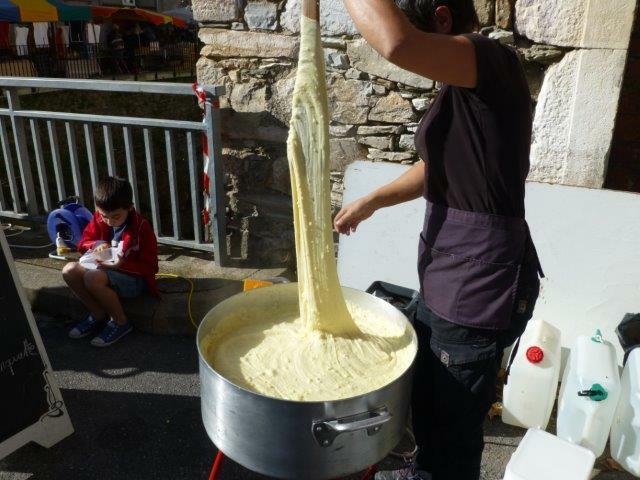 So it looks as though the future of the Fete de la Chataigne is in good hands and will continue to attract lots of visitors to St Pons each October. The only thing missing was the amateur dramatics piece, which is usually presented on a stage across the river, below the tourist office… Perhaps next year?? For me Christmas isn’t Christmas without some mince pies. 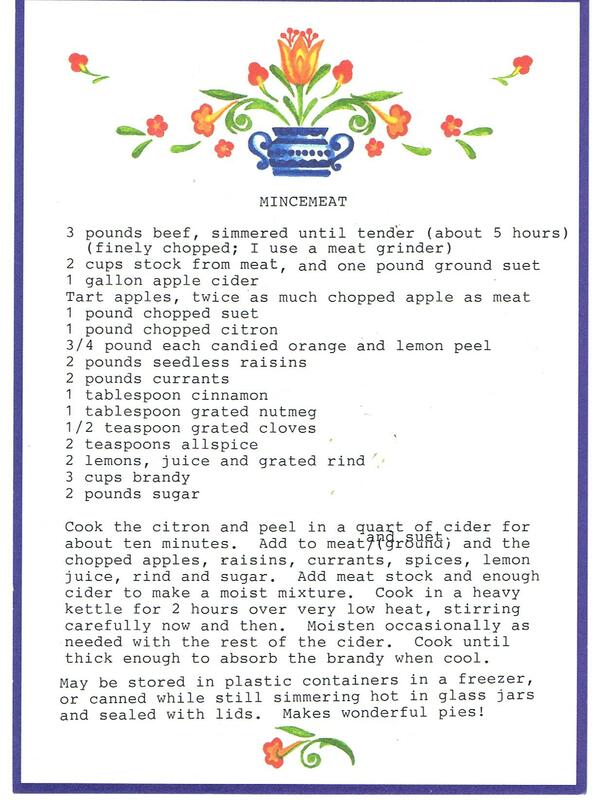 I was fortunate to be given a recipe for mincemeat by my dear friend Nadine Holm. 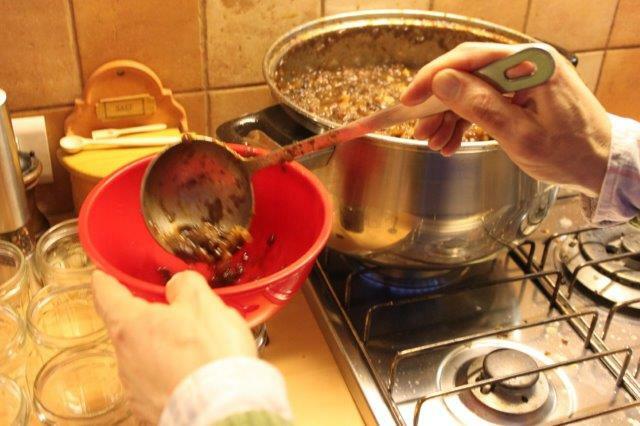 She has been using it for her mincemeat for a very long time, and I believe it’s a fairly old recipe. Why? Because for this recipe you actually add meat! 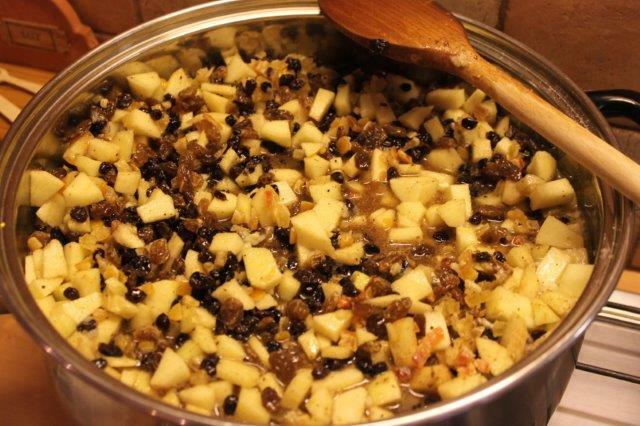 Wikipedia has a fascinating article on mincemeat here. I was very interested to read that the mince in mincemeat and mince pie comes from the Latin minutia, which means smallness. 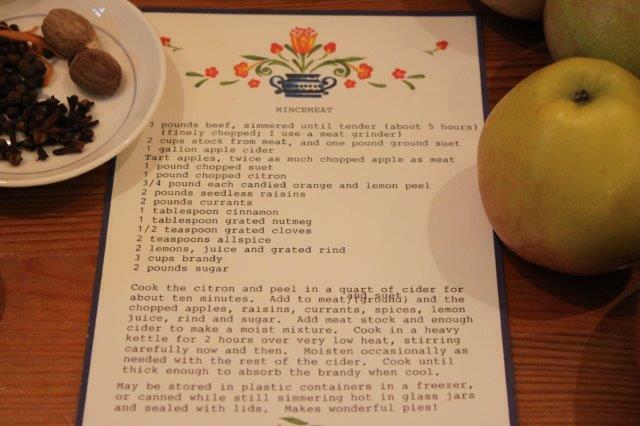 When we mince something we usually make it small, as in chopping, so that makes perfect sense. Weighing out the sugar, raisins, suet and citrus peel was the easiest part. 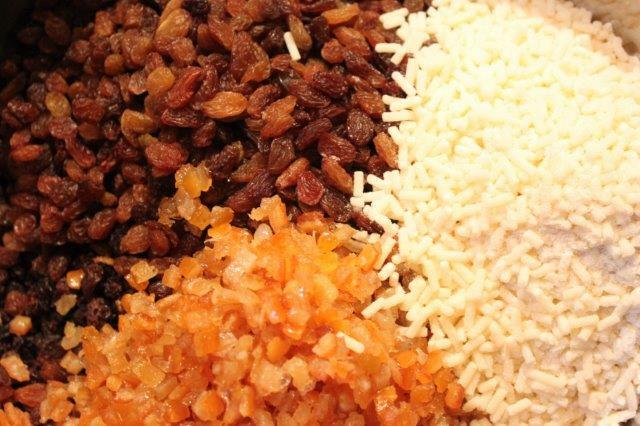 I prefer to use brown sugar for all the recipes which contain lots of dried fruit, such as Christmas puddings, fruit cake and the mincemeat. I managed to get the suet from a supermarket that stocks British products, but I have in the past prepared it myself, buying beef fat from the butcher and grating it – somewhat laborious to say the least! 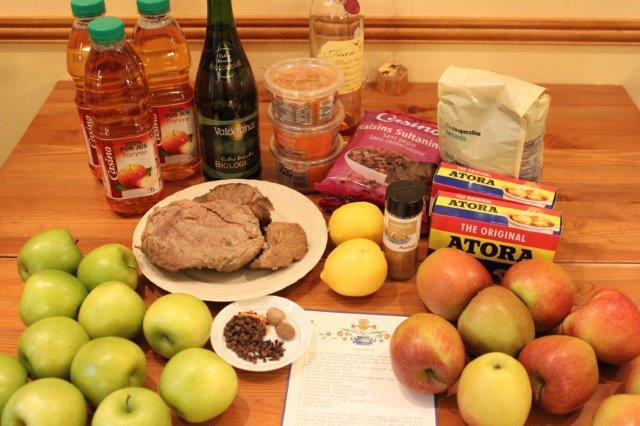 The cooked meat was put through the meat grinder, and the apples were peeled, cored and chopped finely. 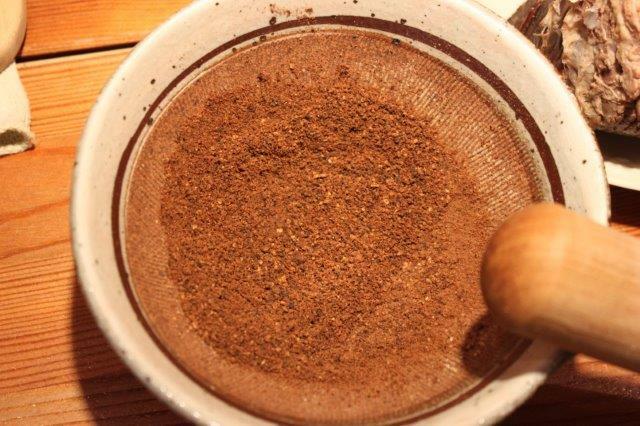 I ground the spices by hand, the aroma was wonderful! Soon we had everything mixed and in the largest pot I have in my house – as you can see it was a tight fit!! 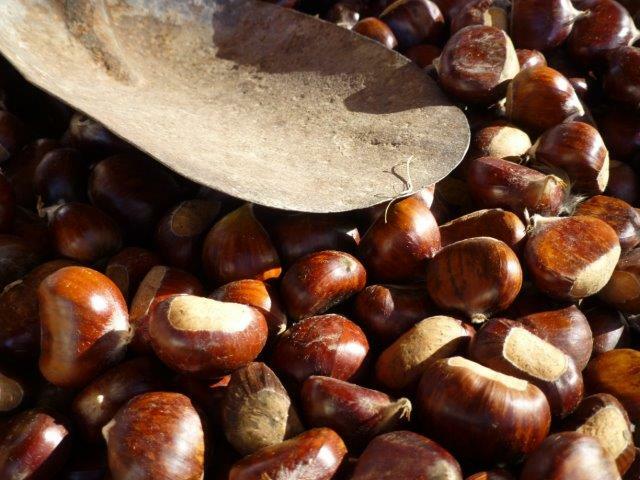 The smell when the pan came to a boil was beautiful – and very reminiscent of Christmas! As it simmered, the quantity in the pan reduced, and the texture changed from very liquid to a more jam-like consistency. I know the colour isn’t very appetising, partly due to the yellow cast from the lighting – I’m sorry!! 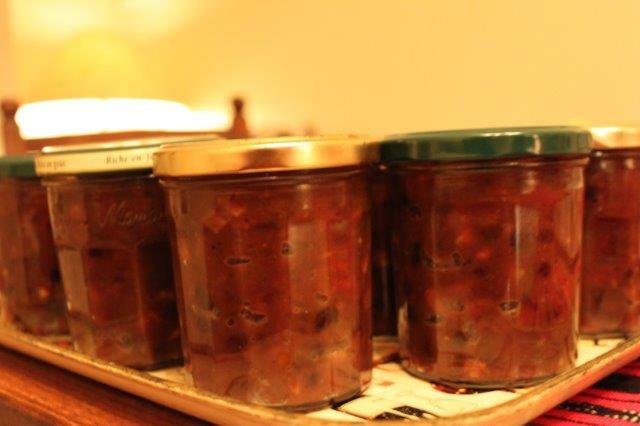 Soon it was time to put the mincemeat into jars. It looks pretty good, doesn’t it? 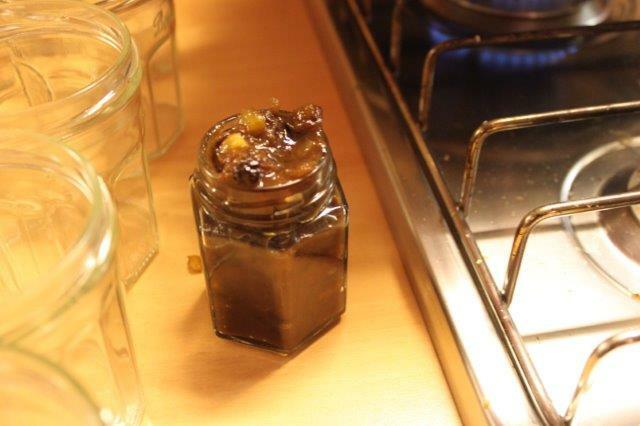 And then we were done, and all the jars were stored on the shelf until we’re ready to make those delicious mince pies! Roll on Christmas! !